China is a country thats so divest and you can practically discover any possibilities and guess what I had discovered a chinese girl trying to auction her breasts to the highest bidder. Taken from Shanghai Daily and really baffled me why would somebody wants to buy Xu Haojia's breasts. The 1.64-meter-tall girl said she weighs 54 kilograms and that her measurements were 85cm, 72cm and 88cm. She added that she wears an E-cup bra. 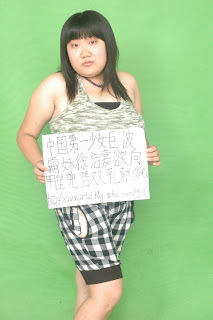 At first Xu seemed like just another Chinese chick trying her luck to be the next internet fame, but it turns out that our dear, overweight, E-cup Xu is literally auctioning her breasts. As in, she will have them surgically removed, and will literally hand her removed breasts over to the highest bidder. I m sure this is definitely a stunt Xu is trying to pull to make herself famous afterall its her dream to become a celebrity. Whatever the outcome, I wish Xu all the best and hope she gets what she wants and I m definitely not bidding for her breasts. In case if you want to know how Xu looks like, check out this picture below and decide whether you want to start bidding!!! Haha.